We have/will be guiding in the Dead Sea area and among the most common issues is the lowering of the sea level - we can point to the receding shoreline at the Ein Gedi Spa, the Lido Hotel now far removed from the shoreline and sinkholes. I have just noticed a short item from a journal abstact explaining the phenomenon. latter is accepted today as being the main mechanism of sinkhole formation. Sinkholes are a product of environmental degradation at the Dead Sea. As the water level drops, freshwater washes out mineral pockets underground. Over time, the freshwater melts the materials inside, generating surface caves and meters-wide craters which can trap people and animals and damage nearby highways, hotels and factories. Last week I had the extraordinary luck to take some small groups on tours of the old City. Each group had wished for an overview of the development of monotheism in Jerusalem. Our meeting point was outside the Tourist Information Office, just inside of Jaffa Gate. We started off with a few “icebreakers”, and headed down David Street, across the plaza of the Kotel towards the City of David. I explained along the way that the Old City is composed of a mosaic of time periods, and since our tour would not necessarily return in the same direction I highlighted the prominent locations along the way and their various time periods – starting from the walls of the city; history of David’s Citadel (which allows a general overview of the time periods); Crusader streets/markets and Mameluke facades; the Kotel plaza and Temple Mount –modern and ancient history. When we arrived in the City of David, people loved the views from the observation point with the contrasts of topography, culture and architecture, religion and politics. The 3D movie was a great success (though possibly not for charedim, and you have to check when it is screened in English – 10.10 and 14.10), and it encapsulated the development of David’s kingdom very successfully – although it leaves people breathless, and requires extra explanation. Juicy stories of Amnom and Tamar, and the conflict between David and Absalom, and the accession of Solomon to the throne, bring the biblical story to life – especially when you point out where David was standing and Bathsheba was bathing on the rooftop, and the events that ensued – the bedroom scene probably took place directly underneath us (according to Eilat Mazar, who happens to be on site wiping her grimy overalls). The Bible begins to come to life and jump out of the pages, and one has to control oneself. I find the excavations under the visitor’s centre - if you enter underneath - more interesting than the terraced hillside for further explanations – but that depends on the size of the group. The journey down through the tunnels is exciting. Stories of the exploits of Warren, and the discovery of the tunnel add drama to the site, and then entering the dry tunnel or for the more adventurous – the wet tunnel, with the aid of flashlights (which are rentable on site) and rolling up your pants is great fun. People enjoy going through the tunnels – something primordial – perhaps it metaphorically connects them to their birth! Note, the water is at a constant temperature, and the path has been leveled. Outside the tunnels, a short walk brings one to the Siloam Pool complex and the Herodian pavement. Beware of shady characters who approach your group claiming to be working on site and selling genuine forgeries of Roman coins! Although, the interaction did add color to the tour. An Arab taxi stand is nearby, and for 25 shekels per taxi, they will take you to Lion’s Gate for the next stage of the tour, otherwise, there is transportation to the entrance of the City of David - 5shekels per person, and from there, it is a very pleasant 15-20 minute walk to Lion’s Gate – with all the views of the Kidron Valley, tombs and Mount of Olives. I will not go into graphic detail of the rest of the day (unless you insist, and send me a photo with your mail), regarding Graeme’s tour of the Via Delarosa and how to find station 9 for the first time on your own, or an in-depth exposition of the Church of the Holy Sepulchre. Though, what I would like to say, is that progressively one has to build up stories of the sites, and colorful anecdotes, and have fun! Beware, that if one of your customers orders a Wiener Schnitzel at the Austrian Hospice, then you should stand behind them in preparation for the Heimlicher movement, other than that, the rooftop views are amazing . I spent the day today with a large family (not mine): Grandparents, parents, and a bunch of kids, ages ranging from infant to 10 years old. The parents are chareidi. They strictly forbade any movies. We met in Safed. We drove to Lake Agamon and rented golf carts. The kids had a ball. Some 25,000 cranes and assorted other birds are now there hanging around for another week or so until they continue on their way up north for the spring. We then took the Daughter of Jacob's Bridge up to the Golan, stopping briefly at the Gadot overlook, and then headed to Mt. Bental. The kids were fascinated about the idea of being on top of a real live (albeit inactive) volcano. They loved running around the trenches and the view of the snow covered Hermon is breathtaking. It's also real cool for people to see Syria from up close. The pizza in Katzrin wasn't kosher enough for the parents. We ended the day at the Talmudic Village in Katzrin. I found it to be very child-friendly. My first official guiding was this past Thursday. My referral came from one of our classmates, and the clients were a 50 year old mother and her 12 year old son. It just so happens that this woman and I were good friends many years ago at Camp Ramah and she is very friendly with my parents. Her son is a sixth grader at a Solomon Schechter school. In addition, the woman is a cantor at a major Conservative synagogue and her husband is a Conservative rabbi. The family is steeped in yiddishkeit and that came through during the guiding. I am going to offer a few highlights and tips. As we drove down to the Dead Sea in Jerusalem I spoke about various topics relating to the desert, geomorphology, E1, the route of the patriarch, Nebi Musa, Mitzpe Yericho and Jericho. 1. Our first stop was at the Lido Hotel where I spoke about the receding Dead Sea. 2. Second stop was the PEF marker. Although it is supposed to be between 203-205 kilometer marker, I had trouble finding the kilometer signs. Since I have stopped here before, I was able to spot the marker fairly easily. I pulled over on the opposite side of the road and we got out. We all climbed up the side of the mountain, touched the PEF marker, read the explanation, took pictures and again I spoke about the receding Dead Sea. I made one brief mention of the PEF and its mission. The 12 year old had lots of fun scampering about. The mother and I made sure we didn't fall and totally embarrass ourselves!!! 3. Masada-We didn't go to the museum, not enough time. The 12 year old had fun running around the storehouses. The highlight was climbing down to the Northern palace. When we went there as a class an artist was painting frescoes. He had just started and was experimenting. If you recall, he told us that he wasn't sure how long to wait for the plaster to dry, and in his first panel, there are artistic mistakes. He apparently corrected that and in the rest of the panels there are no light spots. 4. We wanted to walk to the cistern on the southern side of the horst but there was no time. While this is not the most exciting location to visit, I have taken young boys there before and they love the mini-hike. 5. The mother and I took the cable car down the mountain and sat down by the juice stand area. The 12 year old basically ran down the snake path and had a great time. He had no trouble finding us. 6. Ein Gedi was a lovely hike up the waterfalls…Nachal David. We made it to the synagogue just before it closed. The adults definitely appreciated that more than the 12 year old. 7. Important note: The day before we left I called the National Parks number to find out about flash flooding and the times of Qumran. They said that Qumran closes at 4pm. That was fine with me as I had to get home to take care of kids (Rena is in the states with her father). But the client wanted to go there. We pulled in and noticed that even though the kupa was closed, people were still walking into the park. I prepared to guide every site we went to and even scripted where we would stop. But I didn't expect to have to guide Qumran. I was certainly prepared enough to do a decent job, but my point is you never know what you'll need to guide. Even when you agree with the client ahead of time what you'll see, there can be surprises. The night before the guiding I had read some material on the Dead Sea sect so I had some up to date information, so I was lucky. 8. Getting paid. My client was very easy on this count. She paid me at the beginning of the day in case she might forget. I am grateful she was so sensitive. If she hadn't been I would have reminded her at the end of the day. I'm interested to hear how you guys handle this issue. From Tzomet Kama to (pick one) Ben Gurion Airport/Tel Aviv/Jerusalem. Our tour today takes us into the northern part of the Negev. We’re going to examine this area as it relates to the establishment of Jewish settlements during the British Mandate. The Mandate began after the end of the First World War, and ended May 14, 1948, which was the date the British withdrew from Palestine. The same day Israel proclaimed its independence. The bulk of the settlements in this part of the Negev, however, were established during the period from 1943 through 1946. To understand why so many settlements were set up in such a relatively short period of time, we need to go back a little in history. none of the terms of the Mandate could be modified without the consent of the Council of the League of Nations. Unfortunately for the Jews, things went downhill from there. This was even though Jews had purchased thousands of acres of land in the South. Nothing was stolen or appropriated. Everyone who sold land had deeds, or tax records, or records of the Ottoman land registry, the Tabu. And the sellers usually had more than one form of proof of official property ownership before Jews would buy the land. There were more riots, which got progressively worse, from 1936 through 1939, and there were commissions and recommendations issued in 1937, 1938, and 1939. 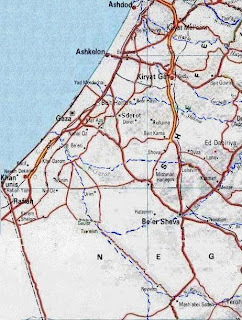 These recommendations progressed from removing the Negev from consideration as part of a future Jewish state, to an even smaller prospective Jewish state to be located only in the coastal plain, all the way to a recommendation that there not even be a Jewish state, but a single bi-national state governed “democratically” by its citizens. This was at a time when the Jewish population of Palestine was around one third of the total. Why did the British so clearly violate the terms of the mandate? And frankly, there were no Jews in the Negev – in fact, except for a few nomadic Bedouin, there were no people in the Negev except in the Gaza subdistrict. Because of Ben-Gurion’s response to the 1939 White Paper, where he said “We will fight the White Paper as if there is no war, and fight the war as if there is no White Paper,” the British knew that they could rely on support of the Jews, no matter how much they appeased the Arabs. And appease them they did! All these commissions and reports and recommendations boiled down to one key point: They served as a slap in the face, a true wakeup call to the Jewish leadership. Whereas the Jewish body politic was, and for years before had been severely fractured and tension-ridden, on this issue they came together and spoke with one voice. They knew that if these recommendations were allowed to stand, there would be no Jewish presence in the Negev, the size of the future Jewish state of their dreams would be reduced by more than half. Moreover, there was a strong likelihood that there may not ever be a Jewish state. The viability of the entire enterprise was in mortal danger! Faced with these prospects the Jewish leadership began to plan, and to gather its resources. Notwithstanding their prohibitions, the British did, in fact, allow a number of settlements to be established in the Negev, although most of them ended up in the Gaza sub-district. Then, in 1943, the situation changed a bit. Although they continued to prohibit new Negev settlements, the British did allow the establishment of observation posts (in Hebrew, mitzpim) in this area, and there was a mitzpeh (a separate post), set up at Mitzpeh Gvulot, at Mitzpeh Revivim, and here, where we are sitting, at Mitzpeh Bet Eshel. We will be visiting all these mitzpim, and a number of settlements, as well. The stated purpose of the mitzpim was to conduct scientific experiments and observations. They examined soils, temperature, humidity, plants, and water – notice that every one of these mitzpim was located on, or near a water source. In the desert, water is the source of life. Gvulot was near the Besor River, one of the only year-round streams in the country; Revivim was at the Revivim stream, one of the tributaries of the Besor, and here at Bet Eshel, the outpost was established near the junction of two rivers, the Be’er Sheva and the Hebron. More important from the standpoint of water, all the way back to Biblical times this place was well known as a place where wells could be dug with relative ease. This was because the water table in this area is very close to the surface, so this became a place where life could be sustained, and where Abraham could relax under his eshel tree, just you are relaxing under the eshel, now. Back to 1943, it’s the middle of World War Two, and the mitzpim and a couple more settlements were set up in the Gaza district, all at a time that the British were very much occupied in other places. I’ve already told you about the open purposes of the mitzpim, but probably more important was the underlying purpose – which was to train an experienced corps of people who could begin settlements of their own. The Jewish leadership is moving, slowly, slowly, toward the realization of the goal to overturn the effects of the recommendations of the White Papers. Studies are continuing, and Jews, although not too many of them, are here in the Negev. Jewish leaders realize that this area could, indeed, become viable. In England and the United States, Zionists are vigorously pressing their case with every politician who could help them offset earlier British recommendations. Then, in 1946, something happens to change the whole settlement enterprise in the Negev. All the planning and preparation, the months of hiding of people, supplies, and materials, pays off. Picture this: It’s Motzei Shabbat, and it’s also Motzei Yom Kippur. People in Palestine go to sleep that evening, October 6, 1946, and when they wake up in the morning, there are ELEVEN new settlements in the South! Reality changes! New facts are on the ground. By 1947, at least one more new settlement is established in the Negev, and more important, the First Negev Pipeline, built with 190 kilometers of surplus British pipe, is sending water from Kibbutz Nir Am South and East to settlements in the Negev. Almost 300 million gallons the first year of operation. The British know that there really is nothing left to do except find a graceful way out of the mandate. In May of 1947 the United Nations Special Committee on Palestine (UNSCOP) is formed. The UNSCOP representatives go to Palestine and investigate the facts as they exist at that time. UNSCOP comes here to the Negev. They see flourishing, growing, thriving settlements. They see Jews being trained in agriculture. They see Jews who are irrigating the desert and making it bloom. UNSCOP reports back to the United Nations, and on November 29, 1947, the UN votes, contrary to all the recommendations of all the British White Papers, to divide Palestine into an Arab state and a Jewish state, and to include the Negev as part of the Jewish state. It is only because of these courageous pioneers, who braved the elements, the desert, and formidable adversaries, and who refused to accept the perfidy of the British, that you and I, as Jews, can sit here under the shade of these eshels, just like our forefathers, and offer hospitality to our guests and partake of the goodness of this land. I am volunteering to maintain this blog that will be designed as a resource for us as we plan and implement our itineraries. I would like to see this as a "Go To" site where we will check out each other's itineraries, learn from one another on how they turned out, learn about upcoming lectures and seminars, found about about how to acquire addition licenses - eg. tour guide driving licenses, tour operator licenses and other information of interest to us. The best way to assure we have a useful blog is to provide it with useful postings. I will serve as the blog administrator and will try my best to assure that useful and timely information is found on the blog. I would suggest that as we take our first steps with the blog that you send you postings to me at MarkZTours@gmail.com. I will then review and edit if necessary then post to our Blog. I will then send out the Blog link to the group so that all you need to do is click and go directly to the new posting. As the postings increase we can then move to having each person post his or her own items. So, please do consider emailing me your itineraries - planned or alredy implemented. If you have already carried out the guiding experience, please write up what you have learned that we should all know if and when we guide in the same area(s). Also, please do comment on this initiative...see bottom of blog entries for posting comments.